The last game at the Camp Nou of 2018 was a somewhat one-sided yet gripping affair. It produced chance after chance for Barça, and such good ones too, that fans leaving the stadium were left wondering how it had ‘only’ produced four goals. It’s a win, coupled with Valencia’s defeat at Eibar, that puts Barça in a stronger position than ever in La Liga, and a massive eleven points clear of next week’s rivals – Real Madrid at the Bernabéu. The Catalans went into it unbeaten, and the early exchanges didn’t suggest that situation was likely to change tonight. Leo Messi sent skyward the kind of chance he’d usually convert, Luis Suárez had his first shot rightly disallowed for offside... And so it continued. The only worrying sign came when Paco Alcácer called to be taken off with a muscle injury that counts him out for around three weeks. Aleix Vidal entered in his stead. Had it not been for some fine interventions by Depor keeper Ruben, the one-way traffic would have led to a goal long before the Suárez finally found the net on 29 minutes. It started with a long ball from Andrés Iniesta, impeccable on his return from injury. Messi controlled beautifully. But although he was in the kind of position where most strikers would have a pop, his Uruguayan partner was next to him, free and unmarked in front of goal. A selfless, and sensible, pass to the right and Barça were a goal to the good. Time and time again Messi has been frustrated by the woodwork this season. It was going happen again. The Argentinian fired onto the crossbar on 38 minutes. And again! Moments later, the Golden Shoe winner drove the ball onto the post – only this time Paulinho was there for the rebound. Bang! 2-0! 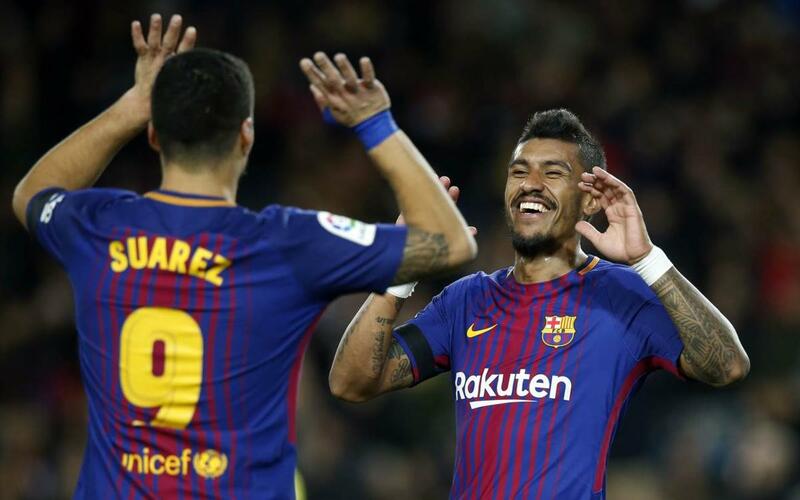 Deportivo were mere sparring partners as the onslaught continued, and just before half time looked to be three down when Suárez’s peculiarly shimmied finish was scrambled away by Ruben. There’s no VAR in La Liga, but for those us with access to the kind of technology that the referee does not, it would seem that the ball did cross the line. Suárez was denied that one, but the second half had barely started when he did indeed convert Barça’s third. A team goal if there ever was one, Iniesta’s contribution was majestic, and as for Sergi Roberto’s cross from the right… words fail. There was more to come. Messi sent a free kick flying… where else but onto the post? And if Suárez had felt hard done by not to get a penalty earlier on, the referee did point to the spot when he was floored by Valverde – Federico of Deportivo, not the manager!. From an individual perceptive, it wasn’t Messi’s night. The inspired Ruben got a hand to his penalty. Goal number four was just around the corner, however and it was almost a carbon copy of the second. Yet another ball onto the post (the 19th of the season, this time from Jordi Alba) and for the second time of the game it bounded into the path of Paulinho. It was his sixth goal of the league season – the most for any midfielder. Just how Messi’s name wasn’t on the scoresheet is a mystery. On 80 minutes another chance went begging. Let’s hope he’s saving up his good fortune for next week. Because now that the Deportivo test has been passed with such flying colours, attention really can start focusing on next Saturday’s Christmas Clásico.